In today’s employment market many people have set-up by themselves to provide professional services to clients on a Freelance or Consultancy basis. Consultants have a legal requirement to maintain accurate accounting records, collect taxes and file tax returns for income tax, National Insurance, VAT and Payroll where appropriate. If you operate as a Limited Company it is also legal requirement to prepare and file formal year end accounts and pay corporation tax. If you operate as a Sole Trader it may not be a legal requirement to prepare and file formal year end accounts but it is certainly good practice to prepare year-end accounts and is likely to be a requirement for banks and other organisations (e.g. life insurance companies) where a record of income is required. Prices: from £100 to £150 per month, ex VAT. 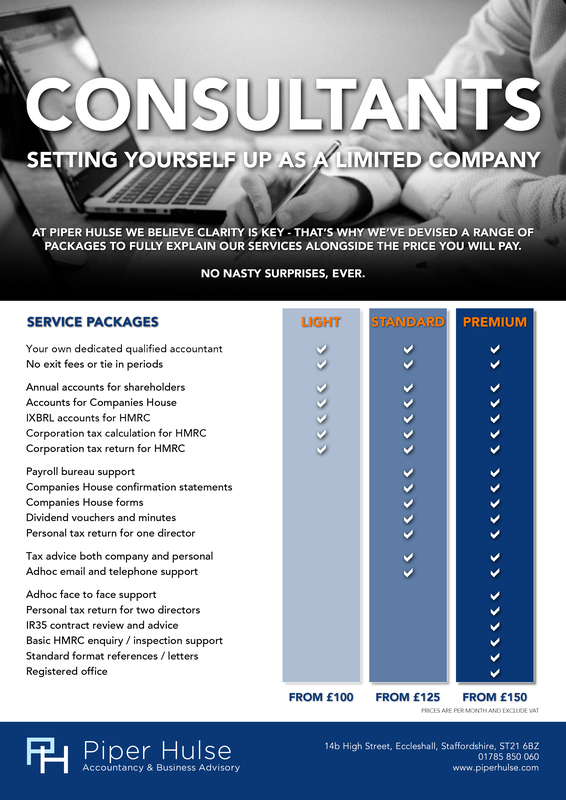 Download a copy of our latest Consultants Packages guide here.